With Chris Paul out, could they survive the unavoidable onslaught from James Harden by at least mitigating the damage everyone else did? 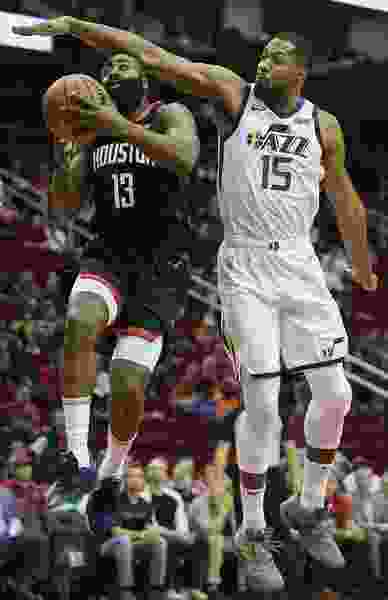 Could Donovan Mitchell break out of his early-season slump and finally channel his on-court aggression into an efficient performance? And if they managed to build a lead, could they weather the inevitable comeback attempt borne out of Houston’s sheer torrential downpour of 3-pointers. Three checked boxes later, the Jazz had earned an impressive 100-89 victory over the Rockets and improved to 2-2 on the season. On the first count, Harden did make his presence felt, scoring 29 points on 10-of-19 shooting, and handing out seven assists. And he did get some help from a vintage Carmelo Anthony, who poured in 22 off the bench. But as a team, Houston shot just 40.2 percent from the field, and made only 11 of their 40 attempts (27.5 percent) from 3-point range. As for Mitchell, the second-year guard scored 38 points on 14-for-25 shooting. After seeing his first shot blocked, he remained undeterred, but also focused. On the next Jazz possession, he calmly drained a floater. A few plays later, he nailed a pull-up trey. He had 11 by the end of the first quarter, 19 by the end of the first half, and he never relented. When not hitting 4 of 9 shots from 3, he was consistently turning the corner on his defender, getting into the lane, and finishing at the rim with an acrobatic contortion. Almost unnoticed among Mitchell’s scoring was that he also led the team with seven assists. There had to be one, of course. Halfway through the third quarter, Utah had amassed a 64-48 advantage. By halfway through the fourth, Mitchell made a rare mistake, Harden picked off the ball, fired it downcourt to a streaking Clint Capela for a dunk, and just like that, the lead was down to five, at 84-79. How would the Jazz respond? By making plays. A lot of them. Ricky Rubio got a step on his man and converted a layup at the rim. On Houston’s ensuing possession, Utah played the Harden-Capela two-man set perfectly through every action, forcing a shot-clock violation. Mitchell and Gobert then ran their own two-man scheme, which culminated in an alley-oop. Then Gobert got his hands in the passing lane for a steal, grabbed an offensive rebound, made it to the free-throw line. And just like that, the threat was over, and the home fans were streaming for the exits. OK, go ahead — check that box, too.